10/20/2016 | SHINGU Sayaka | Tea Bowl GAKUYO — dai ichi arts, Ltd.
We associate flowers with beautiful, bright colors - red, yellow, blue, orange, you name it. Fresh flowers make us happy and uplift our souls. They are glorious when blooming, and offer us warmth and strength. Shigu's flower, however, lets us view life in a different light. Instead of glamorous colors, she gives us a dark, matte bloom that radiates cold beauty. Where we expect ostentation she offers humility, and where we expect frivolity she offers a solemn sense of peace. This bloom's somber demeanor seems to speak of life's highs and lows, but its cool elegance demands not pity but respect. The fierce style and attitude of this piece reminds us that life is not perfect, but that with quiet contemplation one can always find beauty. Shingu's flower is made with colored clay. When making a form with clay, at the beginning, the clay is fully moist and easy to manipulate. The texture of the soft clay is one of joyful movement for the ceramic artist. But the texture changes every second. Moisture is gradually lost and the piece dries up, just as a cut flower is slowly dying despite its apparent liveliness. Clay must be fired, and so the clay flower is burned in the kiln and gains eternal life as a ceramic piece. Shingu's flower works represent both the transience of life and the somber beauty of immortality. 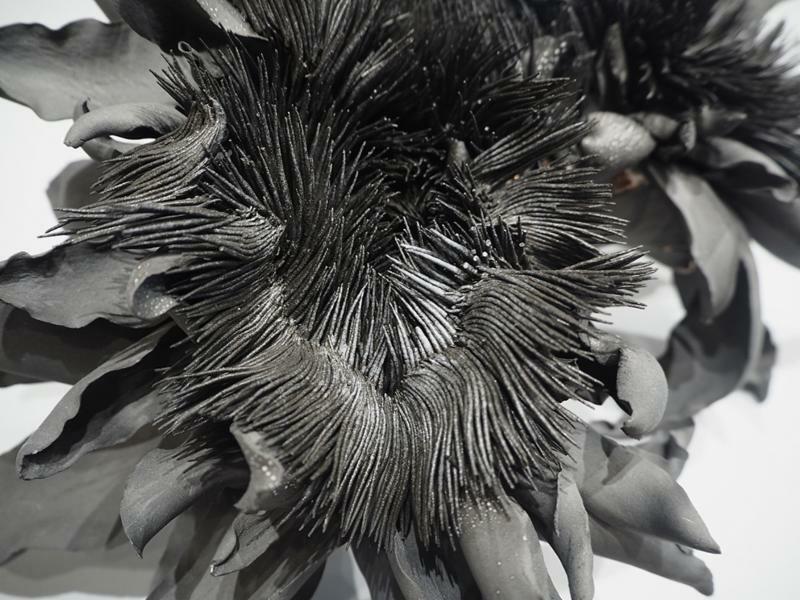 Inside of this strong black flower, Shingu has placed a forest of delicate white and black androecium. She forms each of these small tendrils by hand, despite the fact that sometimes hundreds or even thousands of individual androecium can be found on a single work. These central forms, then, represent an incredible dedication of both time and talent on the artist. This gorgeous work can be relatively small and delicate, but maintains a very strong presence, and will never wither.